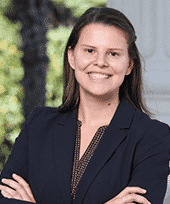 Deanna is excited to bring her experience working in the legislature and on college campuses to expand AES’s influence in local and state politics. She currently serves as a Legislative Aide for Assembly Majority Leader Ian C. Calderon where she primarily staffs him on issues related to Higher Education, Banking and Finance and Local Government policy. Deanna graduated from California State University, Chico with a degree in Psychology and Women’s Studies in May 2016. During her final year, she served as Associated Student President where she worked on issues related to supporting students who are undocumented, strengthening Title IX procedures and establishing a food bank on campus. Deanna is an alumnus of the Jesse M. Unruh Assembly Fellowship. In her free time, she enjoys reading any book she can get her hands on and exploring Sacramento.